﻿ How to Play the ISO Files of a Blu-ray Movie on Mac? home Blu-ray Player for Mac How Play the ISO files of a Blu-ray Movie on Mac Directly? ISO image is often the full copy of a CD/DVD/BD disc. You can not open it directly, a third party tool like Daemon Tools is need for you to get the content in an ISO image. Sometimes you may get the movie ISO image from your friends. At this time, an easy quick way to enjoy the movie will be necessary. In this article, we will recommend the tool to deal with this. As people are bothered by the fact that Mac cannot support Blu-ray, a new fabulous Blu-ray ISO player is coming into use. The Aurora Blu-ray Player is the world’s best universal Blu-ray media player for Mac across the global. It is so powerful that it can support everything, not only Blu-ray disc, DVDs and movies ISO image files, but also music and pictures. What surprised me is the player’s user-friendliness, easy performance and incomparable speed. If you want to enjoy your Blu-ray movie, only three steps need to be followed. First off, you need to be connected to the Internet so that the software can decode the copy-protection used on the discs. Free Download Aurora Blu-ray Player and then install it. Click the"Open File” button and select the local video file in the “Finder”. Press the “Open” button and watch as it quickly loads and begins playing the movie. In addition, there are some advanced interfaces for advanced configurations for the output settings. These interfaces allow you to set parameters regarding title, subtitle and audio. As long as I finished playing, I would share it with friends and family or post my suggestions or reviews about the movie to Facebook or Twitter through a button 'share' . Just get this Blu-ray Player for Mac and enjoy all types of Blu-ray DVD ISO movies as you like. How to Play Blu-ray on Mac Mini? 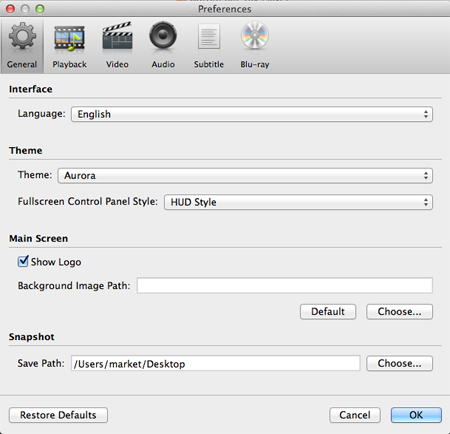 How to Play DivX on Mac Directly? How to Play AVI on Mac Directly? Play Blu-ray Disc on Mac OS X? Play DTS5.1 with Aurora Blu-ray Player for Mac? Play Blu-ray/DVD ISO movies on Mac? Play 1080P MKV files on Mac Smoothly? Play Standard Blu-ray/DVD Movie Folder on Mac?